We have crossed ancient lands, traversed architecturally unsound bridges of questionable origin, journeyed to the heart of this forgotten temple, and placed our mics upon a demigod's alter to bring you part two of our Team Ico focused podcasts. This week, Scott and I discuss the marvels of Shadow of the Colossus as well as historical collections of notable games in general. As always, we would love to hear your thoughts in the comments section below. 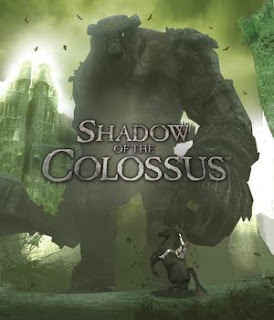 I picked up Shadow of the Colossus the first time around, and was enjoying it immensely - until I fell through the geometry and died during a critical point in a battle. I was so annoyed that I never picked it up again, which I regret. I bought the HD collection, but the timing is terrible. There are too many new games out with multiplayer components that I don't want to miss out on. I probably won't get to it until next year. As far as a wish list goes, if Bioware released an HD remake of Knights of the Old Republic, I'd buy about six copies and give them out. Everyone should have played that game. I've found it interesting that some people are strangely adverse to the concept of HD remakes, questioning whether or not we need them in the first place. One of the most depressing aspects of video gaming is that so much of its history has been obliterated. Developers and publishers rise and fall. New hardware comes along that renders the systems of yesteryear obsolete. It's only been in recent years that publishers have taken charge of their own legacy and decided to revisit the past and repackage it for new gamers, albeit often to mixed results. So you have people like Sega releasing Genesis compilations, Nintendo reworking Ocarina of Time with a 3D gimmick, and Sony offering the likes of God of War and Ico/Shadow. Up until this point, we've had to rely on the efforts of the emulation community to preserve old hardware and the games that were released for them. I have no qualms in owning complete collections of "ROMs" (for want of a better word) for old 8-bit and 16-bit systems, for no other reason than 99% of those titles will never see the light of day again, be it in original or remixed form. Some people will simply sit back and say, "Well, 99% of old games were crap anyway, so do we really need to preserve them?" I think the quality issue is irrelevant. If we start picking and choosing which elements of video gaming history to save and which ones to discard, how will we ever build a credible body of history for the medium? Is it possible to establish an accurate representation of what came before if we only choose to "save" a handful of classic titles? It troubles me that so many games I enjoyed as a kid are completely inaccessible to most contemporary gamers. And I'm not just talking about average, run-of-the-mill stuff. I'm talking about the games considered to be the GTAs, Icos and Portals of their day. It's easy to look back on an old ZX Spectrum or C64 game and say, "Well, it was pretty good back in the day, but not really worth paying attention to these days." But it's happening with titles just a couple of (hardware) generations removed. I'm not suggesting that hardware manufacturers need to fall over themselves to ensure their new hardware is compatible with everything that came before it, nor am I suggested that publishers place as much emphasis on revisiting back catalogs as they should on developing new gaming experiences. In fact, I'm not entirely sure what the solution is, but I would venture as far to say that bloggers and video game journalists need to occasionally consider the bigger picture and at least acknowledge that there's at least 30 years' worth of substantial history to be uncovered in what is otherwise a very forward-looking medium. Perhaps if gamers -- and the people who write about games -- take more of an interest in video game history, then maybe publishers will too. There's no real reason for the games we enjoy today to become tomorrow's ephemera. So I'm essentially one of those remake adversaries. I think there's a big difference between conserving some 16-bit games and starting to remake/bundle games from the previous generation. At some point every publisher's catalogue will be big enough so that we'll be playing the same games over and over again. I'm sure somebody will scream for a SotC or God of War Remake again if the next hardware generation offers native 1080p and 60fps. That being said, I have no technical knowledge about how difficult/ressource consuming it is to upres something like SotC and put it on a new platform leaving the actual content unchanged. All I know is that they already took their sweet long time for the Team Ico Collection and that didn't even include adding new content. I guess what I'm saying is that the videogame industry is at a point where a lot of people feel like there's at least some lack of creativity happening. So I'm just wondering if returning to old stuff and throwing some HD textures on it is really the way to go, especially if the "old" material isn't even a decade old. I guess I've been considering many of the HD remakes favorably because most of the content is still new to me. For example, I never owned a PS2, but I did have access to my brother's. While I bought my own copy of Ico back in the day, I never played SotC, so the Team Ico collection for the PS3 was an essential purchase for me. Likewise, while I had Silent Hill 2 & 3 on the PC, I never quite got round to completing them. The former, in particular, is very glitchy with contemporary video cards (the menu screens are invisible for one thing! ), so I don't really have the option of even playing it any more. So, the Silent Hill HD collection will be a day one purchase for me. And while I've played Metal Gear Solid 1 & 4, I've never played 2, 3 or Peace Walker, so that particular HD collection is right up my street too. I never had an Xbox either, so I missed out on the better part of an entire generation of console gaming (I did have a PC, GameCube and Dreamcast though), so if Activision ever want to release a Metropolis Street Racer/Project Gotham Racing collection, or if Sega want to release a Jet Set Radio collection, that'll be fine with me. I guess I could buy a used PS2/Xbox and hunt down used copies of all those games, but the HD collections are a more elegant solution for me. I can see how people who played those games not so long ago may not consider the HD collections to be worth the time/effort to get them out (I haven't bought the new versions of RE4 or Code Veronica because I played them back in the day and my memory of each is quite fresh), but for those of us who never had a PS2 or Xbox the first time around, they're quite invaluable. Wow, this just reminded me that they really are going crazy with those HD collections these days. I guess you could justify this by saying that with HD resolution TVs there was a pretty big leap in technology a couple of years ago, so saying that games aren't really ported to just a new console generation but more to a new video technology that'll still be here when new consoles arrive does make some sense. Now that I can get behind. As much as I'd like to get my teeth into SH2&3 again, I'd like to see a decent SH game on current generation hardware. By all accounts the series has been in decline since the fourth installment. Yes! I'd be all over a KOTOR HD re-release. I'm with Retro here. The folks who scrubbed up Ico/SotC I'm sure only minimally distracted the Team Ico folks from working on an entirely new game. If anything, it might even give the devs good insight into their old gaming, reminding them of what made it great and maybe inspiring some new ideas for different projects. If anything, those in charge of the Silent Hill franchise should re-release those older ones and get a second creative wind. Yeah, well, I guess I'm fighting windmills here anyway, they just announced the Jak&Daxter HD Collection. Wonder if they're thinking about putting out a new one of those on PS4 or something. That first one was pretty awesome and Naughty Dog's probably sick of Uncharted by now. "The folks who scrubbed up Ico/SotC I'm sure only minimally distracted the Team Ico folks from working on an entirely new game. If anything, it might even give the devs good insight into their old gaming, reminding them of what made it great and maybe inspiring some new ideas for different projects." I have to say, I'm feeling a lot worse going around stabbing the Colossi in the head this time round than when I played it back on the PS2. I almost wince as the blade sinks in.